You are currently browsing the Carpe DMM blog archives for October, 2014. 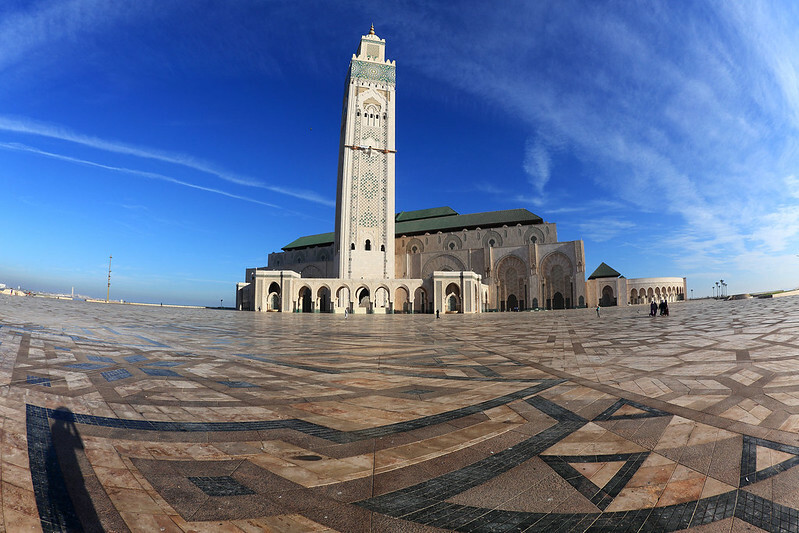 We are in the tour bus, setting off from Casablanca for Rabat, after touring the Hassan II Mosque, the third largest mosque in the world (as we were told). I slept well until about 05:00, but M. said she had a restless sleep. We went down to breakfast at 07:00 sharp. I had just yoghurt and corn flakes, and some prunes and dates, avoiding the eggs and bread today. M. tried a different pastry. After eating, we returned to our room and packed, then went down to check out and meet up with the tour group at 08:00. Lahcen herded us onto a minibus with our luggage and then we drove off to the mosque for a public tour. We got there by 08:30, and Lahcen told us to assemble at the front entrance of the mosque by 08:45, giving us a few minutes to walk around and take photos of the outside. The building is stunning from the outside, and visually defies one’s sense of proportion. It looks like someone took a normal sized building and just scaled it up about five times. Surrounding it is a large flat courtyard paved with patterned stone, which is used for prayers during special events when the mosque is full inside. We are having a brief rest in our room before heading out for the day. Our tour meets up this evening, so we have the day to explore Casablanca a bit for ourselves. We are planning to go have a look at the cathedral of Sacre Coeur and then grab a taxi out to the Morocco Mall, the largest shopping mall in Africa. It will be a slightly relaxing day, no hectic sightseeing and rushing around. We got to bed before 21:00 last night and slept through to about 04:00 before stirring a bit and then snoozing drowsily for a few more hours. We are feeling mostly refreshed his morning. We went down to breakfast just a few minutes after 07:00. It was a fairly standard hotel buffet, with cereal, scrambled eggs, chicken sausages, croissants and pastries, yoghurt, bread rolls, and fruit. The fruit included dates in bunches still on the stalks. These were a pale brown colour and firmer and slightly smaller than the medjool dates we get at home. They tasted a bit less sweet, but were very nice. As we were finishing up, the waiter brought out a dish of fried bread, which we had to try as it looked intriguing. It was light and airy in the middle, with a crisp oily crust and slightly salty, not sweet at all. 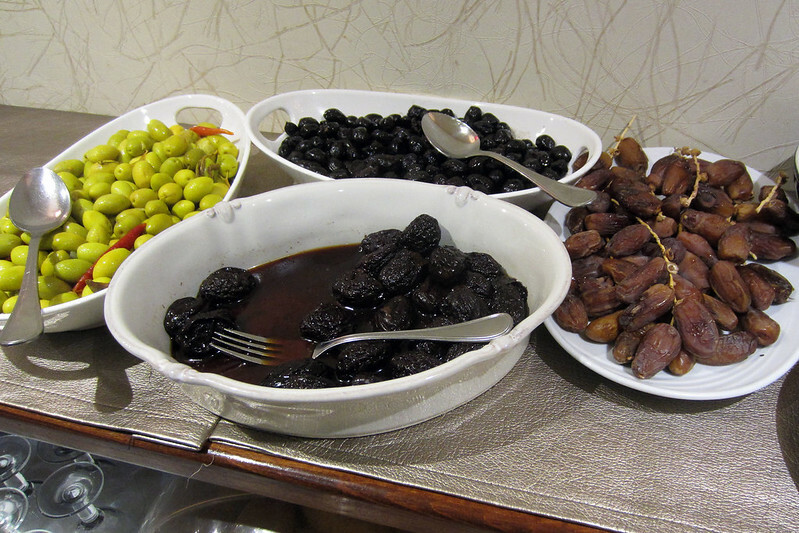 Olives and dates for breakfast.